Information Backwards Compatible with Easy Script. 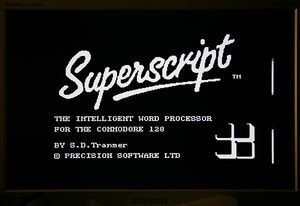 Superscript 128 or Script 128 is a word processor for the Commodore 128. There is also a version for the Commodore 64 and for other 8-bit home computers of the era. Superscript 128 is an early example of a software product that was available both as a full version and an in-place upgrade of a previous software product to the current version. SuperScript 128 Manual (PDF) courtesy of Archive.org. This page was last modified on 10 October 2017, at 16:20.